, founder of the sect of Arminians, or Remonstrants, was born at Oudewater in Holland, 1560. He lost his father in his infancy, and was indebted for the first part of his education to a clergyman, who had imbibed some opinions of the reformed, and who, to avoid being obliged to say mass, often changed his habitation. 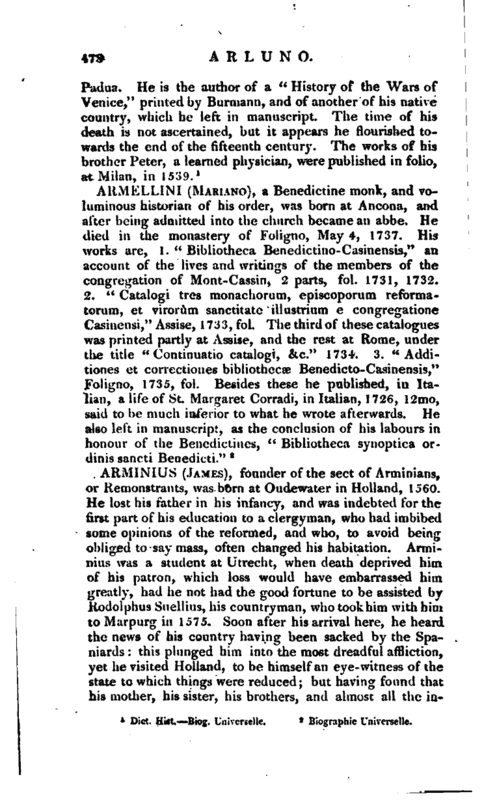 Arminius was a student at Utrecht, when death deprived him of his patron, which loss would have embarrassed him greatly, had he not had the good fortune to be assisted by iiodolphus Snellius, his countryman, who took him with him to Marpurg in 1575. Soon after his arrival here, he heard the news of his country having been sacked by the Spaniards: this plunged him into the most dreadful affliction, yet he visited Holland, to be himself an eye-witness of the state tc which things were reduced; but having found that his mother, his sister, his brothers, and almost all the | inhabitants of Oude-water, had been murdered, he returned to Marpurg. 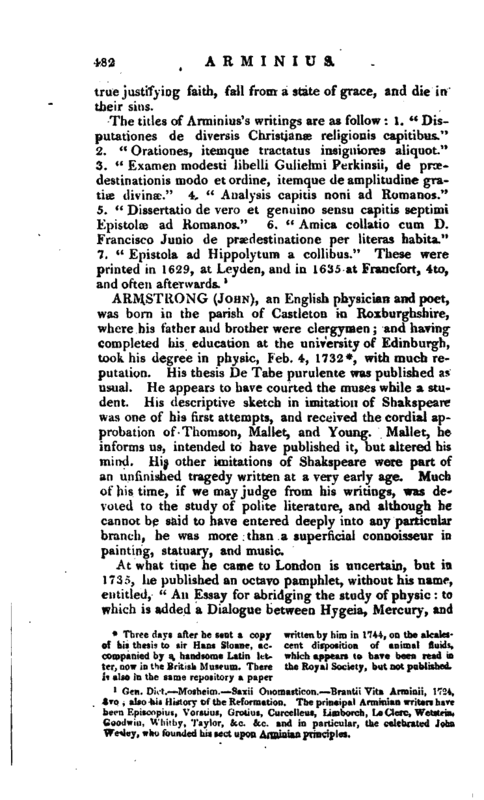 His stay here was, however, but short; for, being informed of the foundation of the university of Leyden, he went again to Holland, and pursued his studies at this new academy with so much assiduity and success, that he acquired very great reputation. He was sent to Geneva in 1583, at the expeuce of the magistrates of Amsterdam, to perfect his studies; and here he applied himself chiefly to the lectures of Theodore Beza, who was at this time explaining the Epistle to the Romans. Armiuius had the misfortune to displease some of the leading men of the university, because he maintained the philosophy of Ramus in public with great warmth, and taught it in private: being obliged therefore to retire, he went to Basil, where he was received with great kindness. Here he acquired such reputation, that the faculty of divinity offered him the degree of doctor without any expence, but he modestly excused himself from receiving this honour, and returned to Geneva; where having found the adversaries of Ramism. less violent than formerly, he became also more moderate. 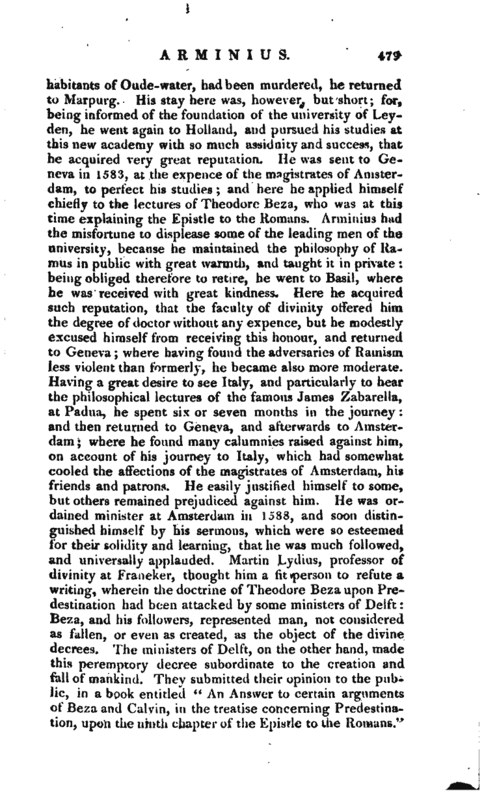 Having a great desire to see Italy, and particularly to hear the philosophical lectures of the famous James Zabarella, at Padua, he spent six or seven months in the journey: and then returned to Geneva, and afterwards to Amsterdam; where he found many calumnies raised against him, on account of his journey to Italy, which had somewhat cooled the affections of the magistrates of Amsterdam, his friends and patrons. He easily justified himself to some, but others remained prejudiced against him. He was ordained minister at Amsterdam in 1588, and soon distinguished himself by his sermons, which were so esteemed for their solidity and learning, that he was much followed, and universally applauded. Martin Lyclius, professor of divinity at Franeker, thought him a fit person to refute a writing, wherein the doctrine of Theodore Beza upon Predestination had been attacked by some ministers of Delft: Beza, and his followers, represented man, not considered as fallen, or even as created, as the object of the divine decrees. The ministers of Delft, on the other hand, made this peremptory decree subordinate to the creation and fall of mankind. 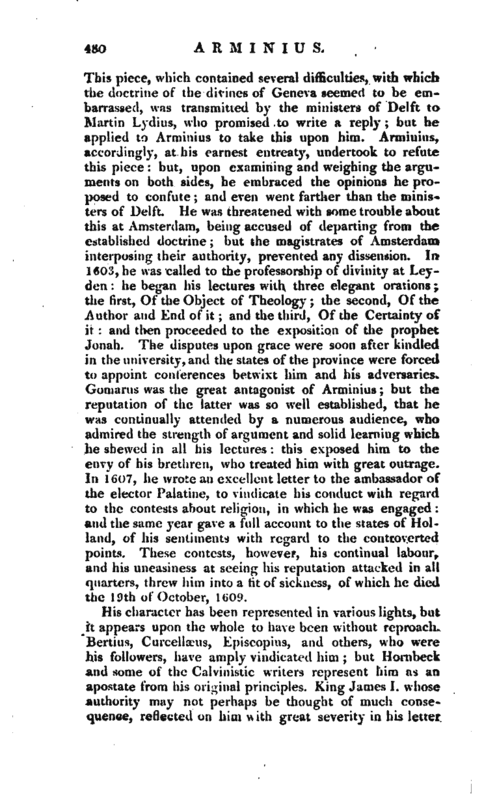 They submitted their opinion to the public, in a book entitled “An Answer to certain arguments of Beza and Calvin, in the treatise concerning Predestination, upon the ninth chapter of the Epistle to the Romans.” | This piece, which contained several difficulties, with which the doctrine of the divines of Geneva seemed to be embarrassed, was transmitted by the ministers of Delft to Martin Lydius, who promised to write a reply; but he applied to Arminius to take this upon him. Arminius, accordingly, at his earnest entreaty, undertook to refute this piece: but, upon examining and weighing the arguments on both sides, he embraced the opinions he proposed to confute; and even went farther than the ministers of Delft. He was threatened with some trouble about this at Amsterdam, being accused of departing from the established doctrine; but the magistrates of Amsterdam interposing their authority, prevented any dissension. In 1603, he was called to the professorship of divinity at Leyden: he began his lectures with three elegant orations; the first, Of the Object of Theology; the second, Of the Author and End of it; and the third, Of the Certainty of it; and then proceeded to the exposition of the prophet Jonah. The disputes upon grace were soon after kindled in the university, and the states of the province were forced to appoint conferences betwixt him and his adversaries. Gomarus was the great antagonist of Arminius; but the reputation of the latter was so well established, that he was continually attended by a numerous audience, who admired the strength of argument and solid learning which he shewed in all his lectures: this exposed him to the envy of his brethren, who treated him with great outrage. In 1607, he wrote an excellent letter to the ambassador of the elector Palatine, to vindicate his conduct with regard to the contests about religion, in which he was engaged: and the same year gave a full account to the states of Holland, of his sentiments with regard to the controverted points. These contests, however, his continual labour, and his uneasiness at seeing his reputation attacked in all quarters, threw him into a fit of sickness, of which he died the 19th of October, 1609. His character has been represented in various lights, but it appears upon the whole to have been without reproach. Bertius, Curcellaeus, Episcopius, and others, who were his followers, have amply vindicated him; but Hornbeck and some of the Calvinistic writers represent him as an apostate from his original principles. King James I. whose authority may not perhaps be thought of much consequence, reflected on him with great severity in his letter | to the States of the United Provinces in 1611. His principles, however, obtained many friends in England, and during the seventeenth century the divines of England were in general attached to them, particularly after the time of Laud, and more openly after the restoration. Before this period, the Puritans, and afterwards the Nonconformists, adhered to the Calvinistic system. How far the articles of the church of England belong to the one or the other, has lately been the subject of a very elaborate and learned controversy, of which some notice will be taken under the article Calvin. In the mean time, we shall state the distinguishing tenets of the Arminians; but it must be remarked that among modern divines there are many shades of opinion, which renders it difficult to lay down any set of principles which shall be admitted by general conseut. 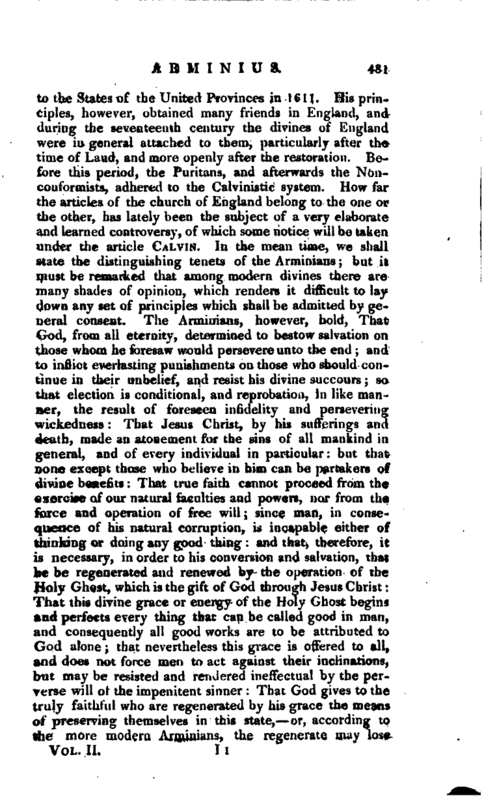 The Arminians, however, hold, That God, from all eternity, determined to bestow salvation on those whom he foresaw would persevere unto the end; and to inflict everlasting punishments on those who should continue in their unbelief, and resist his divine succours; so that election is conditional, and reprobation, in like manner, the result of foreseen infidelity and persevering wickedness: That Jesus Christ, by his sufferings and death, made an atonement for the sins of all mankind in general, and of every individual in particular: but that none except those who believe in him can be partakers of divine benefits: That true faith cannot proceed from the exercise of our natural faculties and powers, nor from the force and operation of free will; since man, in consequence of his natural corruption, is incapable either of thinking or doing any good thing: and that, therefore, it is necessary, in order to his conversion and salvation, that he be regenerated and renewed by the operation of the Holy Ghost, which is the gift of God through Jesus Christ: That this divine grace or energy of the Holy Ghost begins and perfects every thing that can be called good in man, and consequently all good works are to be attributed to God alone; that nevertheless this grace is offered to all, and does not force men to act against their inclinations, but may be resisted and rendered ineffectual by the perverse will of the impenitent sinner: That God gives to the truly faithful who are regenerated by his grace the means of preserving themselves in this state, or, according to the more modern Arminians, the regenerate may lose | true justifying faith, fall from a state of grace, and die in their sins. Gen. Dict. Mosheim. —Saxii Onomasticon. Brantii Vita Arminii, 1704, 8vo i also his History of the Reformation. The principal Arminian writers have been Episcopius,' Vorstius, Grotius, Curcelleus, Limborch, Le Clerc, Wetstein, Goodwin, Whitby. Taylor, &c. &c. and in particular, the celebrated John Wesley, who founded his sect upon Armenian principles.